Gold edged lower Wednesday, maintaining a price below $1,650 an ounce for a second session. The U.S. dollar offered resistance as it fluctuated between gains and losses, eventually settling a tad higher. Gold for April delivery shed $4.50, 0.3%, to close at $1,645.10 an ounce on the Comex in New York. 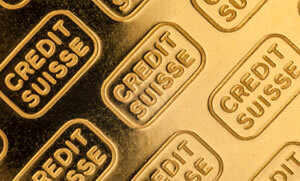 The precious metal traversed through intraday trading levels of $1,640.70 and $1,655.00. "Support from both the investor and spec (speculative) community is needed in order for gold to stage a convincing recovery from here," UBS said in a note according to Reuters. "But the lack of urgent fundamental motivation makes it difficult for gold market participants to muster enough conviction." Silver tracked gold, despite analysts at HSBC raising their silver price forecasts. Silver for March delivery slipped 15.0 cents, or 0.5%, to settle at $30.869 an ounce. "Greater industrial silver consumption is one of the most compelling arguments in favor of higher prices," said analysts at HSBC. MarketWatch reported that HSBC hiked their 2013 silver target to $33 from $32 an ounce and also upped their 2014 target to $31 from $28 an ounce. Rising for a second straight day, April Platinum gained $12.50, or 0.7%, to $1,729.70 an ounce, trading between $1,717.80 and $1,735.90. Sister metal palladium advanced for a third day in a row. Palladium for March delivery added 65.0 cents, or 0.1%, to $772.05 an ounce. Prices ranged from $766.00 to $777.60. On Wednesday, both American Eagle gold and silver coins notched gains for a second day. Advances were a bit stronger, though not to the levels logged on many days last month. The Chaco Culture silver coin total moved down 400 on Monday. The Chickasaw silver coin total last Tuesday was adjusted lower by 2,260. The week earlier its sales had trimmed by 40. Such negative adjustments are very atypical in U.S. Mint reported bullion coin sales. All bullion figures above are in the number of coins sold. Calculate total ounces by using the bullion coin’s weight.